I’m not one want to show off but, seriously, check out my moves. Oh alright, this isn’t me and no matter how many yoga classes I do in 2017 it aint ever going to be – I’m as flexible as a steel spoon. If you find exercising in this freezing weather a struggle (well that’s my excuse anyway) then maybe a hot 37° could persuade you to don the lycra. 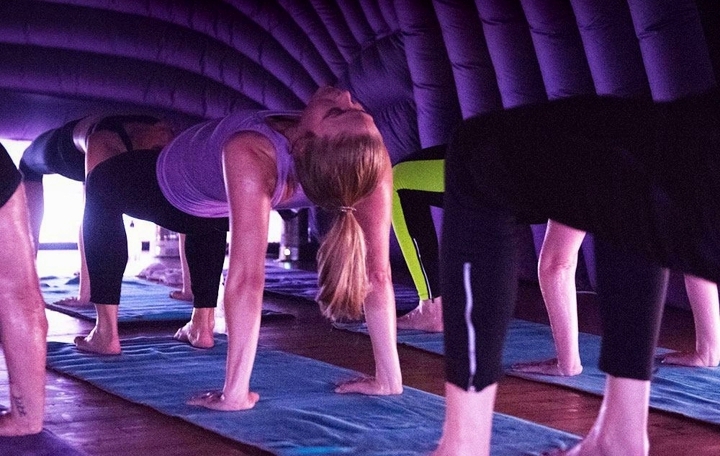 Hotpod Yoga has just launched in Cambridgeshire this month, and it’s guaranteed to make you sweat. You never know, with perseverance you might be able to contort yourself into positions you hadn’t thought possible since your fabulous 20’s. Pippa Davis is the poppet with the pop-up, having turned her back on a career in law to train as a teacher and pursue her interest in teaching yoga. Having recently moved from Nottingham, where she taught hot yoga, she’s now based in the village of Willingham, 10 miles north of Cambridge, with her three children and for now she’ll be running all classes from her purple pod in Willingham village hall. So what of this inflatable tent? 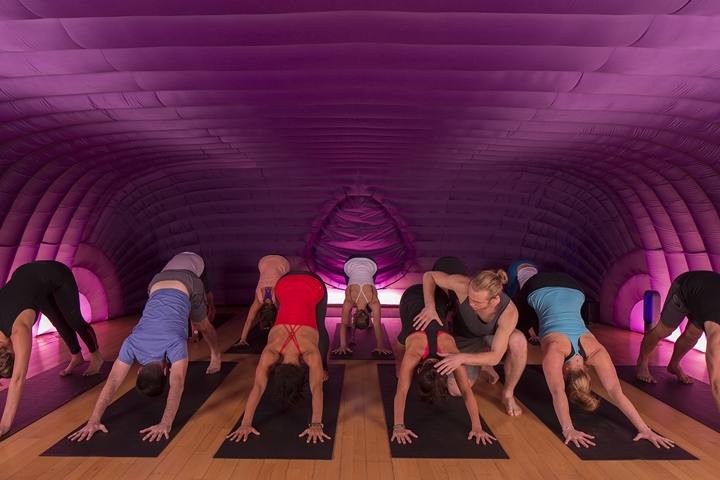 Hotpod Yoga is housed in a pop up 20-person high spec inflatable tent kept at a regulated 37° – think bouncy castle with a hard floor. Classes are taught using the Vinyasa (or flow) yoga, which uses controlled breathing and challenging moves to calm the mind whilst providing an intense body workout. The heat warms muscles and aids flexibility as well as making the heart work harder: the pod creates a calming immersive environment. The merits of yoga are splashed on almost every mag you pick up these days but unless you’re a serious yogi bunny it’s hit and miss to find the class that’s right for you. 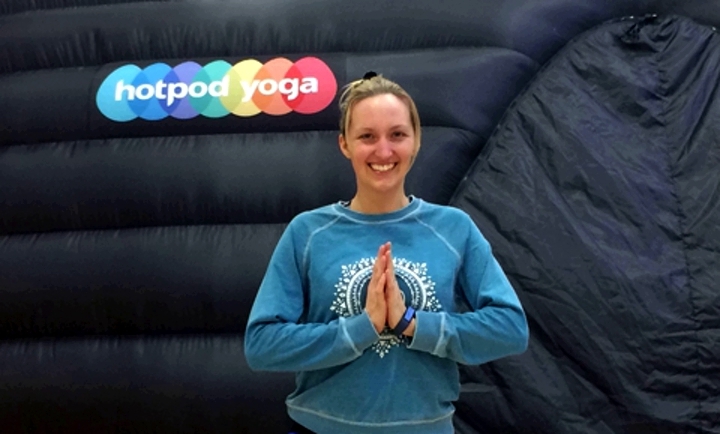 I’ll put my hand up and say I’m a total yoga novice, and was nervous about what Hotpod yoga would entail, hey, I’ll do anything for you lot, so I went along to check it out a few weeks back. The first thing to tell you is that if you’re a beginner like me, don’t sweat it – the temperature is pleasant, not so hot that it’s difficult to breathe. Pippa is friendly and welcoming and keen to find out more about those attending her class. The atmosphere is convivial, not hippy dippy and thankfully for your self-conscious correspondent, no chanting. There were clearly those who knew their dolphin pose from their warrior, but there was no pressure on those who didn’t have a clue what they’re supposed to be doing (*cough*, like me) and there were advanced versions of each pose to ensure that everybody’s suitably challenged. The pace is easy to keep up with, and by the end I was beginning to get the hang of the various poses. I was, shall we say, ‘perspiring heavily’ but it isn’t claustrophobic and after an hour I emerged like a mole from a hole, feeling rather pleased with myself, and about half a stone lighter from water loss. Pippa has the only Hotpod Yoga franchise in Cambridgeshire so if you’re keen to try a form of yoga that’s not as hot or physically demanding as Bikram this is the place to give it a go. If you can’t make the planned class times then the nearest hotpods outside of Cambridgeshire are Saffron Walden (Essex) and Milton Keynes (Bucks). If you’re looking for other forms of yoga then Camyoga have four locations dotted around the county: Buckden Marina, Great Shelford, Mitcham’s Corner and central Cambridge offering a range of yoga classes for a variety of levels. Hotpod yoga individual classes £12; 5-class pass £45; 10-class pass £80. Special not-slip mats are provided so all you need to bring is a towel and plenty of water.